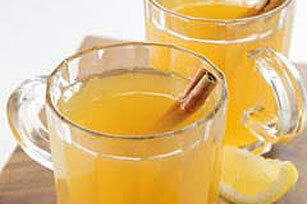 Apple juice, brown sugar and lemonade mix are heated and infused with cinnamon sticks and whole cloves for a warm aromatic beverage. Measure drink mix into cap to 1-qt. line; place in medium saucepan. Add 2 cinnamon sticks and all remaining ingredients; stir. Cook on medium heat 5 min. or until heated through. (Do not let boil.) Use slotted spoon to remove spices; discard. Pour drink into mugs. Add 1 of the remaining cinnamon sticks to each.